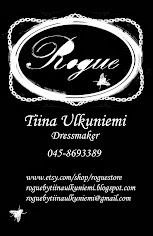 Rogue by Tiina Ulkuniemi: Flea market day! Today I'll be attending the Sorsapuisto flea market again. Prices are even lower than last week so if you did not come last week now is your chance. I'll be selling clothes, shoes, jewelry, accessories and manga books. Hopefully I'll sell some stuff and get more space in my closet. These are little something I made out of the leftover fabric when I made the dress last week. Two different kinds of tops in size S. The fabric is polyester satin. The lower one is one sale at Ateljeekatu. If I'm lucky I might be able to find more of this fabric. So this one is on sale at Ateljeekatu. So go and find it because yet again. I do not have more of this fabric so it is one of a kind.